Over the past few weeks AJ and I have been reading and studying Homer’s Iliad. 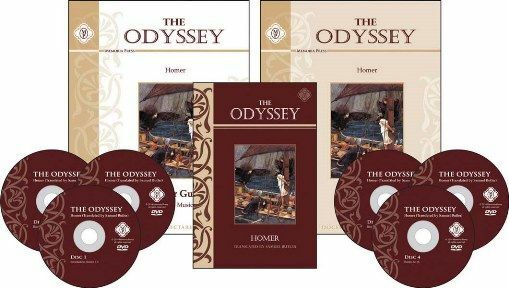 We received the Iliad & Odyssey Complete Set from Memoria Press it has made the process of learning about these ancient texts a lot easier. We looked forward to reading these Epics and were excited to get started. We received a copy of the Iliad translated by Samuel Butler. The book is 447 pages long and is broken up into 24 books. The print size in the book is nice. AJ commented that she didn’t have to squint to read the words and that she could actually see them easily. Along with the book we received a Student Guide and a Teacher Guide. For each book in the Iliad there are two pages in the Student Guide to complete. The first section lists important places and characters and gives more information about them. The next section has comprehension questions. These vary in difficulty. Some are simple answers that are pulled straight from the book while others require a little more thought. Who is the better warrior- Ajax, son of Telamon, or Hector. There isn’t a correct answer but the questions do force the student to think about the story on a deeper level. Since The Iliad was written so long ago, it can be a difficult read. The Student Guide tries to make it as simple as possible. In the appendix there are genealogical charts and other helpful information to help your student keep track of who is who and which side different cities are on. We found this section very valuable. 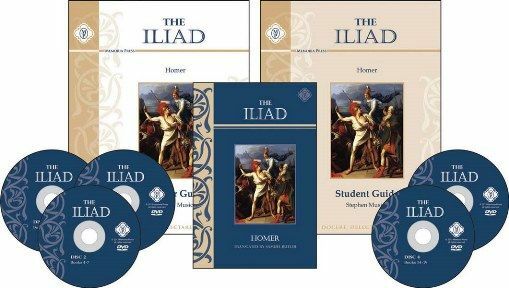 The Teacher Guide for The Iliad is different from other Memoria Press guides we have used in the past. While the Teacher Guide has all of the information contained in the Student Guide, it has so much more. Each book begins with Background and Drill. This section gives more in depth information about important topics. There are also sections on Discussion Help, questions the students should mark for tests, Teacher Notes, and additional assignments for the student to complete. There are writing assignments for almost every book. These include memory work, summaries, compare and contrast, opinion, and more. There are three tests included in the Teacher Guide. These tests are not easy! When your student is able to pass the tests they will have a great understanding of The Iliad. The best part of the package was the Instructional DVDs. Sean Brooks gives a video lecture for each book in The Iliad. The lectures were not boring, in fact AJ enjoyed watching the lectures. Mr. Brooks is excellent at explaining what is going on in each book and why it is important. I felt the DVDs were what made me feel confident to teach these books. They really took the study to the next level. Our copy of The Odyssey is also translated by Samuel Butler. It is 358 pages long and broken up into 24 books. Like The Iliad, the text size is nice and the book is well made. The Student Guide and Teacher Guides are set up very similarly to the guides for The Iliad. I appreciate that because when we get to The Odyssey AJ will already be familiar with the set up. There looks like a lot of fun assignments to go along with The Odyssey. One that I think AJ will like is from book 7. It asks the student to choose a location for Scheria and defend it geographically. They have to describe how to get back to Ithaca from that point. I like that they are forced to think deeper. I watched a few of the DVD lectures, and they did not disappoint. I am sure that AJ will like them as much as she likes the lectures on The Iliad. At first we tried to use the program as it is designed in the Teacher Guide. The student reads a book each day and completes the work. Together both books should take around 18 weeks to complete. The study really seems to be written for more of a classroom student with classwork and homework, than for a homeschooled student. It was just too much for AJ. This book is not an easy read and requires a lot of concentration. We are not classical homeschoolers and she had never heard of the Trojan War. I think a student who is use to Memoria Press would be able to catch on a lot faster. After a few days I decided to change things up. We are currently not using the Student Guide at all. We are reading a book out loud over a day or two depending on the length and then on the following day watching the lecture and discussing the discussion questions. My plan is to have her read through both books and watch all of the lectures. When she is done and is more familiar with all of the characters and what is happening in the story she will read them again. At that point I will have her fill out the study guides, take quizzes, do the memory work, and dig deeper. I plan to give AJ a high school English credit when she is completely finished. If you are looking for a way to teach your child these difficult texts, this is hands down the way to go. I don’t think you will find a better study. Between the Teacher Guide and the Instructional DVDs you will have everything you need right at your finger tips.